These are the words of an untold number of family caregivers who are struggling to provide care and support for loved ones, while at the same time maintaining some balance in their own lives. The good news is there is somewhere to turn for help. You don’t have to do it alone. There’s a way to ensure the independence and safety of your loved ones while still having time for a job, a home, the rest of your family – and yourself. 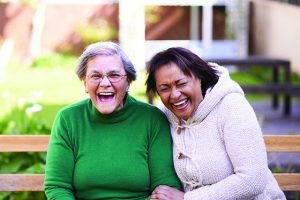 As we continue to observe National Family Caregivers Awareness Month, here are 50 surprising ways non-medical home care can be there for you and your loved ones. How Has Home Care Been There for You? In many ways, the support home care can provide is limited only by the imagination. If you’re a family caregiver, we’d love to hear about how home care has supported you in your caregiving journey. And how else it may be able to help family caregivers maintain balance in their lives. What were you surprised to learn home care could do? Share your stories and ideas in the comments! Need support providing care for a loved one, but don’t know where to turn? FirstLight can help. Imagine all of the ways a little extra assistance could help your loved one – and simplify your caregiving journey. And then call FirstLight. Let’s talk about how we can help you. Find a location near you today.